I love to help my fellow moms and dads find great books for kids and every Monday I share a list of our favorite reads. If you are looking for picture books to read aloud, chapter books to enjoy together or books for your emerging reader, I have a book list that will help you. Be sure to scroll down the page to find what you are looking for. 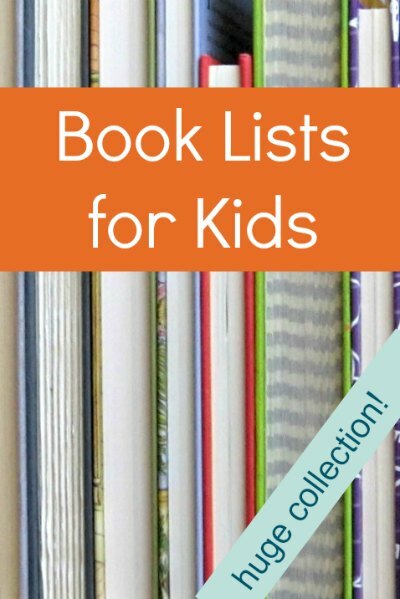 Book lists are grouped by type and age range. If you’d like to keep up with our book lists, please join our email list. As a bribe thank you I even have a special printable bookplate for your kids to color and affix inside their books. You will receive a weekly newsletter that arrives in your inbox, so not only will you get the book lists, but also our indoor activity ideas, parenting thoughts and game suggestions. Picture books are an amazing way to inspire your kids to look at the world from new perspectives. They introduce vocabulary, ideas and spark the imagination. Reading out loud to your kids from day one sets them up for success. And don’t forget, picture books are not just for little kids. Read picture books to upper elementary and middle school kids (dare I say teenagers, too?) and your whole family reap the benefits. These are picture book lists that will inspire kids to create, dream and spread kindness in their community. Please note that I make a concerted attempt to make sure all my book lists are diverse and feature protagonists from all walks of life; these are book lists specifically targeted at diversity. For diverse holiday books, scroll down to the bottom of this page. Are you looking for picture books about a particular topic? Dragons, moons, snow, math or picnics, for example? I try to find out-of-the-box topics as well as more common ones. I take the time to read all the books I recommend so I know you will love them too. In the past I have shared 1-4 lists each year of my favorite newly published picture books. I’m sort of a nerd when it comes to following the latest publication trends and I love to apprise you of my findings! The book on these lists stand the test of time, and even though the lists may be a few years old, the children’s picture books on them are still worth reading. I have a huge soft spot for poetry but I know it can be a tricky thing to love for many people. That’s why if you are new to poetry, I advise you approach poetry with baby steps. No need to start with Byron. My goal is for you and your family to come to learn to love poetry and I’m confident these books will do the trick! 8 ways to include poetry to calm your kids! Reading folktales to my kids has opened my heart and mind to the splendid power of traditional story telling. There is a reason why these tales have survived through the centuries. Folktale books speak to everyone, no matter what his or her age. I know you and your kids will adore these comforting and thought-provoking folktale picture books. These books are for kids who have graduated past easy readers but are not yet ready for middle grade fiction. The age range for these books is approximately 6-10 years and each list has books in the easy to challenging range. Parents looking for this type of book will find my parent tips for choosing early chapter books useful. I aim to go beyond the usual suspects and recommend thrilling books to your kids who have been turned on to reading through a favorite series. These age categories are not mutually exclusive so don’t feel restricted to any one list based on your child’s age! They are often based on what my son was reading at that age. These themed book lists range from narrow interests (like princesses!) to more general “favorites” book lists. Don’t see the theme you are looking for? Email me! Note that I attempt to make all my themed and age-range lists inclusive of a variety of experiences. These lists simple focus on a more narrow cultural, social or ethnic identity. I did a series of lists featuring 20th century book and chose 10 books for each decade. 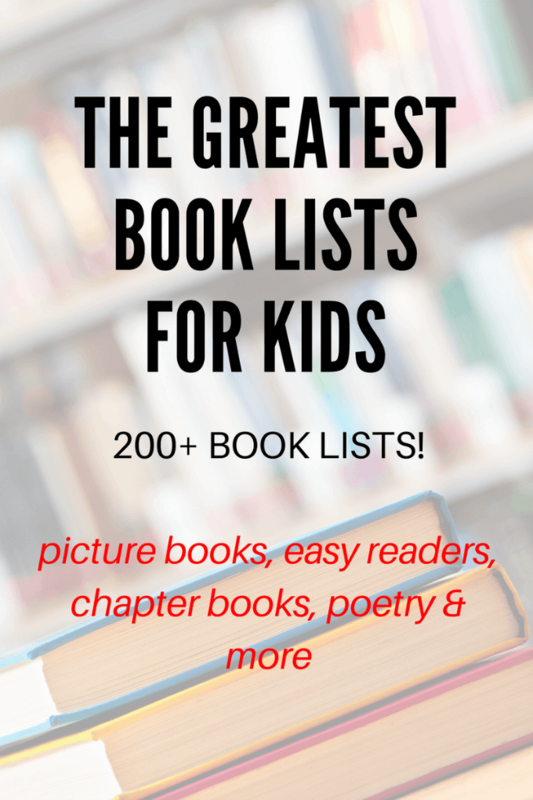 I selected a few well-known books, but primarily included lesser known titles to expose kids (and parents) to books they may otherwise have missed. The books range from early chapter books to middle grade fiction. UPDATE: I’m now working through the decades with picture books. These are books I’ve singled out that are wonderful to read together. Children are able to understand read alouds at a higher level than their reading level. If you have kids with a large age gap, try my parent tips for reading to differently-aged kids. Of course, all these books can be read independently, as well. Amy of Sunlit Pages wrote a wonderful guest post for me about helping young children learn to love chapter books. Ages are general suggestions, not limiting recommendations. 100 Funny Chapter Books for Kids, with choices for early chapter books, middle grade and family read alouds. Read Aloud Classics You Haven’t Read Yet! Seasonal book lists are some of my favorites to curate! Inclusion on one of these lists doesn’t necessarily mean the book is about that season, just that I believe reading the book aloud evokes the feeling of that season. In addition, these lists include some of our all time favorite read aloud books. Cozy up! This is a new series I’m working on, so check back for updates! Each book list will contain picture books, chapter books and poetry — all perfect for reading aloud to the kids during the year. Is a holiday coming up? I’ve got a few suggestions! I put my best effort into making sure each of these holiday book lists contains a diverse selection. These books range from picture books to middle grade nonfiction. I’ve included biographies in this category, as well. I am definitely a fiction reader but this is a kids book lists category I am looking to expand. Email me with your suggestions! Don’t forget! If you don’t want to miss my weekly book list (or other parenting and kid activity ideas) you can subscribe to receive email updates. Please note: I strongly advocate you check out books from the library! However, all of my book lists contain affiliate links.